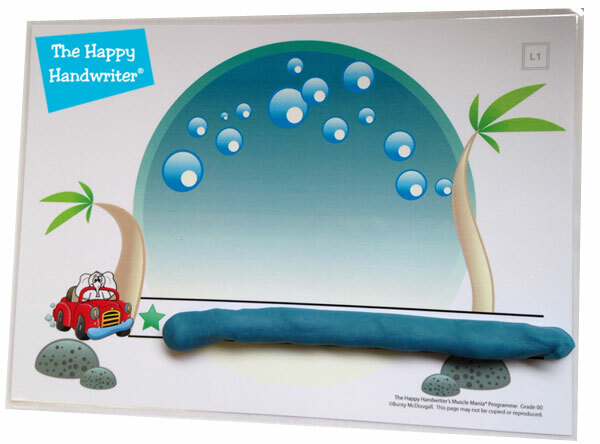 Our children’s first works of art are random scribbles on a page. Within a few short years these scribbles have been transformed into the beautifully crafted letters that make up handwriting. This is a critical scholastic milestone because handwriting is the foundation for story writing and composition. Some children make the transition from scribbles seamlessly, while others get stuck. They remain in the scribble phase, while their peers go from strength to strength, leaving them further and further behind. Pre-writing skills activities are needed to help transition them from scribbles to script. We know that there are certain foundations that need to be in place before children can commence with formalised handwriting instruction. Handwriting is like the top block on a block tower. You can’t place the top block unless the earlier blocks are properly balanced. A poorly built tower is going to come crashing down, just as handwriting is going to go horribly wrong if the foundational building blocks are not in place. Just as you need many blocks to build an impressive tower, there are many foundational skills that need to be in place to master handwriting. The muscles and movement patterns for pencil control need to be in place, as do the visual-perceptual foundations. It is on these, and many other foundations, we may begin to build our letter formation tower that starts with scribbles and is topped off with letter formation for handwriting. Scribbles are one of the foundational blocks. From there they develop into lines and strokes. These include the vertical, horizontal, diagonal and circular lines. 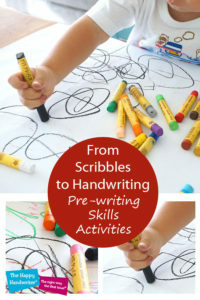 Some children easily and naturally transition from scribbles to well-controlled lines and strokes. They put the lines and strokes together to form beautiful artistic pictures of houses with roofs, a sun in the sky, and put diagonal lines together in a well-controlled way to form a unicorn’s horn. But for other children, this doesn’t seem to happen. It is my experience that this is usually due to poor fine motor foundations that result in poor pencil control. Poor pencil control means children lack the fine motor control to transition those scribbles into lines and strokes. With children’s early exposure to preschool comes the inevitable judgement from other children. Their raw honesty leads them to say: “your drawing looks like a scribble,” and that is the last piece of art work your child brings home. They avoid painting and drawing, and remain stuck in the scribble phase. We know they need to move on so their scribbles can become discernible lines and strokes. At this point, where they studiously avoid participation in art activities for fear of judgement from their peers, we need to find a way to step in and nurture them over the bump. Providing more of the same is not going to get them over this bump. More opportunities to paint and draw are simply more opportunities for avoidance. We have to intervene and offer something different that will empower the child to move from scribbles to lines and strokes. 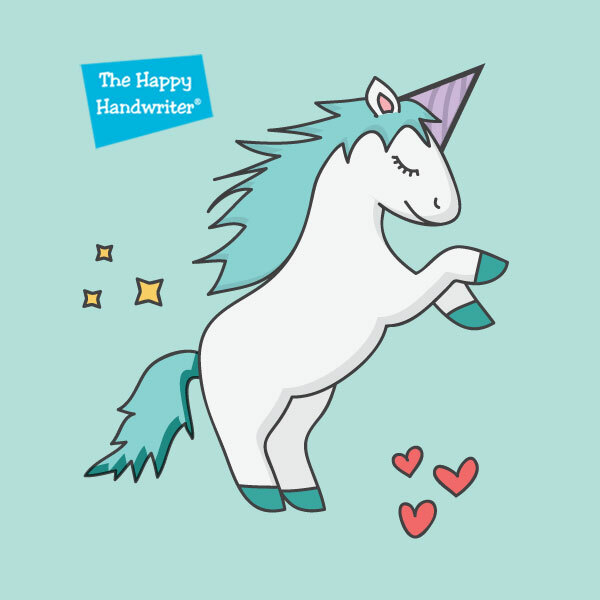 The internet is bursting with worksheets with dotted lines and strokes for children to trace over. I am of the firm opinion that these sheets are frequently a mismatch between the developmental abilities and interests of children, and the demands of these worksheets. 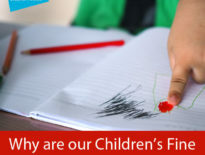 The children stuck in the scribble phase simply lack the fine motor control required to accurately trace the lines. This diminished accuracy is often what landed them in this position in the first place. In addition, the worksheets lack sufficient opportunities for the repetition required to master the lines and strokes. And lastly, but probably most importantly, children at this stage should not be doing worksheets. Worksheets, on a limited scale, belong in the Grade 1 classroom and beyond. We need fun interaction that fosters engagement, since engagement is one of the foundations of improvement. One of my favourite phrases is “children learn when they are having fun.” So, how can we harness these principles to get our children to transition from scribbles to lines and strokes? When it comes to mastery of these lines and strokes, I believe in rhythm, and I believe in repetition. And it is at this point that I need to acknowledge my eternal gratitude to the Wheels on the Bus song! They say go big or go home. So we start off big, singing the song and motioning the direction as the children follow the movement with outstretched arms. “The elephant in the bus sits down, stands up, sits down stands up.” And this is the beginning of the vertical line. It is fun, it is a song, and children are unknowingly laying the foundations for the vertical line. The song also assists with establishing rhythm, and following the direction with the arm helps when we get to drawing the lines. Now that we have sung the song, it is time to “build” the lines. I love the building process and all that goes into rolling out a play dough sausage to form a line from the elephant to the car. I frequently find when children start off, their play dough sausage is anything but cylindrical and well formed. But as they follow this process for each of the lines, they gain mastery over it. And I love watching children as they achieve mastery. It is as though they grow taller on the day they finally get it. So, building is always the second step and from there it’s time to commit our line to paper. 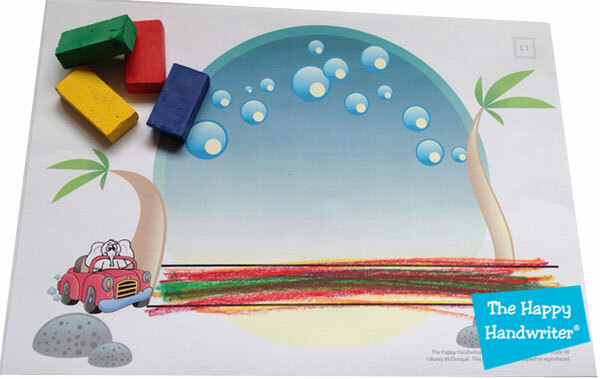 Because the bus goes “there and back, there and back, there and back,” the repetition goes without saying, and the rhythm assists the children to get a rhythmic flow as they draw the lines. Each time the words of the song take them “there and back,” they are drawing “there and back”. And that is a lot of repetition. Then, just like we make rainbow letters and numbers® with handwriting which provides opportunities for the repetition that lays down motor maps for letter formation, we use the rainbow colours here too. Once the bus has gone “there and back” with the red crayon, the next option is the green driver. And so we go – slowly building in the movement pattern for each stroke and slowly gaining mastery over its reproduction. 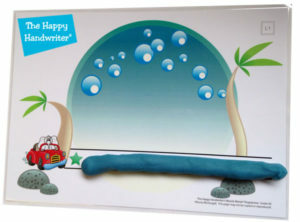 This is a unique Happy Handwriter approach. Both because of the engagement we get from the children, and from the repetition. Compare this to a worksheet that has a few horizontal lines to be traced over. The graphics on those worksheets are usually adorable but the page is only so big which limits the repetition. 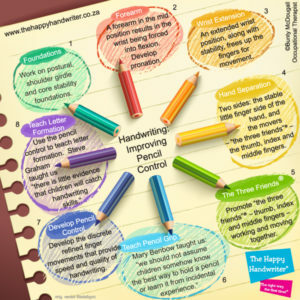 Also, it usually requires refined pencil control to trace over the lines, rather than the bold movements that we get with The Happy Handwriter’s Lines and Strokes pre-writing skills activities for which you can view the video here. This is the fun innovative approach that gets our children over the bump from scribbles to lines and strokes. Once lines and strokes are well-established, it is time to put them together to form shapes. Vertical and horizontal lines form a square house, and the diagonals the roof. I believe in the sensory-motor approach for mastering shapes. So, we build, we sing, we use tactile input, and we draw them, again with rainbow colours to provide ample opportunity for repetition. From scribbles, to lines and strokes, to shapes, and finally letter formation. This is the journey that all our children need to travel to enable them to write stories, complete examinations and take notes. Upon reflection, it is humbling that this all starts with a scribble.